It was an area around Odawara-city, and there was the embroidery industry that prospered from the Meiji era to the Showa era.Ueda was born in the house which assumed NUIHAKU business and came to help with business from about 16 years old in earnest. The work lifted the work in a level of the art in Showa 30's while industry declined without most while keeping one, the skill of NUIHAKU.I asked Ueda about the thought to bet on embroidery. When asked about the woodcraft of Hakone and Odawara, most people think of ‘Parquetry’, however one more type of workmanship is Inlaying, this style of creative process varies from person to person, the main style is ‘Parquetry’ made of straight geometric patterns, where as Inlaying is more like a picture. First lets learn a bit of the history of Inlaying. It is said Inlaying was first performed in Syria, from there it move along the Silk Road and arrived in Japan during the Asuka period. During the Edo period Inlaying was used in cabinet making by way of hand carving and engraving. In 1892 in Hakone Yumoto, Shirakawa Senseki developed the ‘pulling out inlay technique’ using a jigsaw. Then in 1907 using an unusually large plane, was able to slice the ‘negative’ several times resulting in a way to mass produce the Inlays’. Later on Inlaying masters were also able to greatly improve the techniques of dyeing and shading. The creative process is begun by first finding a piece of wood that befits the picture, this picture is then copied onto the bottom board, using a jigsaw, many copies of the picture are cut out. These pieces are then fitted into a carved piece of wood、which is then in turn sanded down until smooth. After this glue is added to the piece (the negative) the negative is sliced thinly using a big plane, and then stretched out using an iron, finally to strengthen the piece, Washi (Japanese Paper) is added to make a lining. Uchida Sadaji, Is often referred to as a modern master craftsman, he is down to earth and while being interviewed his smiling face could almost be that of a child’s. I later heard, Mr. Uchida always put his mother and family first and loves them very deeply. This interview went on for 5 days, and even though it must have been bothersome for Mr. Uchida he always had a friendly welcome for me as I came and went. 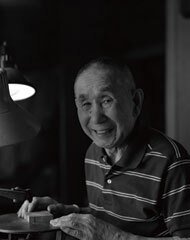 Mr. Uchida’s works not only show the warmth of the native timber used but also show the warmth of his heart. [Odawara City] StrapyaNext Co.Ltd / izumi jewery Shimano / meat shop Nakagawa / Shonan Star Club / [Minami Ashigara City] Pixera Co.Ltd [Kaisei Town] Osakana Shokubou Wahanaza　[Ninomiya Town] Kojima dental clinic white essence Ninomiya branch　[Yokohama City] Medicare.Co.Ltd.